High Radiation Area – Should be posted with signs and alarmed. For first responders, a description of the source is optional but useful. Posting is required by regulation. Inventory and Leak Tests – Both must be done every six months. Separate records must be kept for leak testing and inventory. Leak test records cannot be used as inventory records. Inventory can be done in instruments such as scintillation counters by confirming that it is working properly – no need to dismantle. If source is leaking, notify regulators and store leaking source in safe manner. Leaking is confirmed by activity above 185 Bq or 11,100 dpm. Must show that this activity can be measured above background. 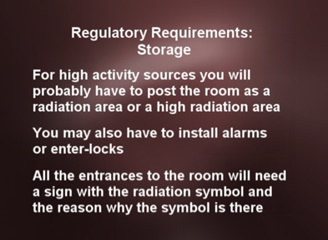 Regulatory Requirements – Need training specific to the irradiator. Ancillary workers and First Responders need training – First Responders need to know where source is and level of risk. Security – Make sure sources cannot be stolen or lost. Plan for emergencies – use shielding if needed, lead is best but soil can be used too – 4 inches of soil is equal to 1 inch of lead. 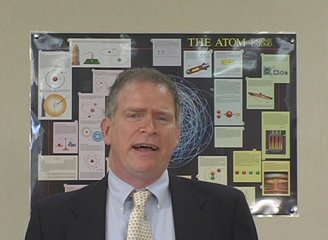 The program is packaged with 10 training certificates, and a reproducible quiz.